Do you want to know How To Download Poco Launcher For All Redmi Devices? Then you can simply follow the guide given below and Download Poco Launcher For All Redmi Devices. There are so many people who don’t like the MIUI Default Launcher and they go to play store and start searching for different types of Launchers for their phones. One more reason why people don’t like MIUI Default Launcher is the App Drawer. You don’t get App Drawer Feature on MIUI Default Launcher and also you don’t get 3D Touch features on MIUI Default Launcher. So, if you are having these types of problems then this article will be game-changing for your device. Recently Xiaomi announced a latest smartphone Poco F1 so, this device has everything that you need to have on a smartphone. You can use POCO F1 Launcher On Any Xiaomi Devices out there (Supported on almost all MIUI Phones). Poco F1 runs on MIUI almost, Poco F1 has a customized launcher which has App Drawer Feature. This launcher is in Beta Stage so, you will find some bugs in this Launcher. But on 29th August you will get the Stable Update On Play Store. Once the Stable Update rolls out will post the link in this article itself. 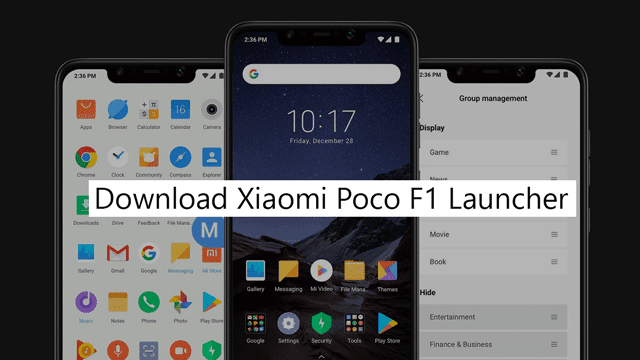 You will see that you have successfully installed Poco F1 Launcher On Your Xiaomi Phone. You get App Drawer in this launcher. Swipe Up to open all your apps and games. And the best thing you get 3D Touch Feature in this launcher how cool is that. This is all features that you get on Poco launcher. The POCO Launcher works great for MIUI Phones. Simply Download it and you are good to go. Again this launcher is on Beta Stage so you will get the update on 29th August. We have used this launcher on Redmi Note 5 Pro, Redmi Y2, Redmi 5A and it works very well. But on Redmi 5A when you use 3D Touch you will see that the options disappear from the side this is due to small screen. But no need to worry about all these problems will be fixed once the stable update starts rolling out. Go To Settings >> Installed Apps >> Search For “System Launcher” >> Tap on System Launcher >> Then Tap On Uninstall. That’s it. So, this is all about How To Download Poco Launcher For All Redmi Devices, If you have any question regarding this launcher or if you are facing problems while installing this on your device then make sure to comment down below. We would love to hear from you!